Look at that tiny smirk. Good Smile Company’s big-headed McCree figure is every bit the roguish cowboy fans know and love, even if his high noon is a lot lower than normal. Joining the Nendoroid Overwatch figure roster next July, this version of McCree packs a whole lot of swagger into a small package. Don’t let the smile fool you, he’s also got a face sculpted for action, complete with tiny toy cigar. I love the giant hat. I love the articulated cape, perfect for dramatic posing. You will believe a McCree can fly. And if I didn’t love the hat or cape, that’s okay. Both of them come off for a more casual look. Hey kids, its a Brian Crecente figure! I’m not sure I like casual McCree. I prefer him charging the enemy, confident in his abilities, completely unmindful of the fact that he is taking on mechs and robots with nothing more than a six-shooter. Oh yeah, that’s the guy. 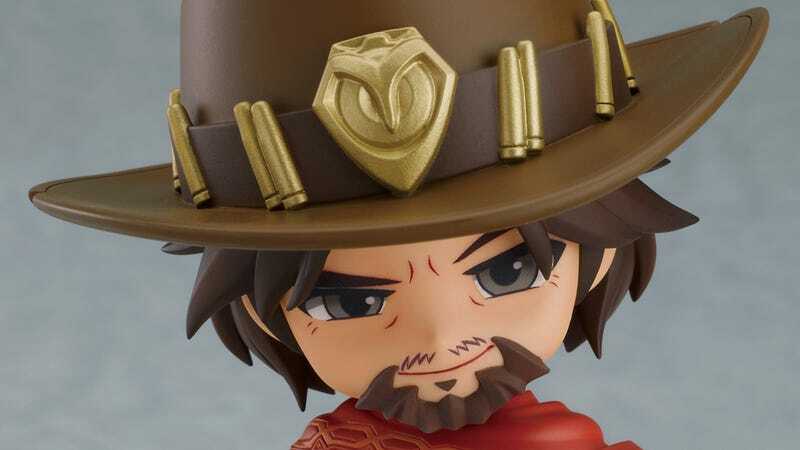 Tiny McCree is available for preorder now from the Good Smile Company for about $45. He joins a whole host of big-headed Overwatch figures that I am collecting despite never really playing the game.